I have been trying so many different products over this past month which is totally out of my element! Once I find something that really works for me, I stick to it. I have dry skin and my skin is also super sensitive because I battle with psoriasis so certain popular products just don't work for me. Every other month or so I get into these kicks after watching YouTube beauty guru's (yes I admit I'm addicted) that just makes me want to explore and potentially find products that work better for me. I LOVE makeup, like LOVE makeup (and skincare) and I get so excited when trying new things. products, that's one source apart from YouTube that I can trust to give me honest opinions I'm interested in. So with my skin and it being so dry, a lot of "matte" products I have to make sure and moisturize really well, as well as make sure my face is completely clean before applying anything. Even sometimes then, it won't make a difference with a matte product. Also, as much as I wish I was a bronze goddess, Casper is the here and now, haha. 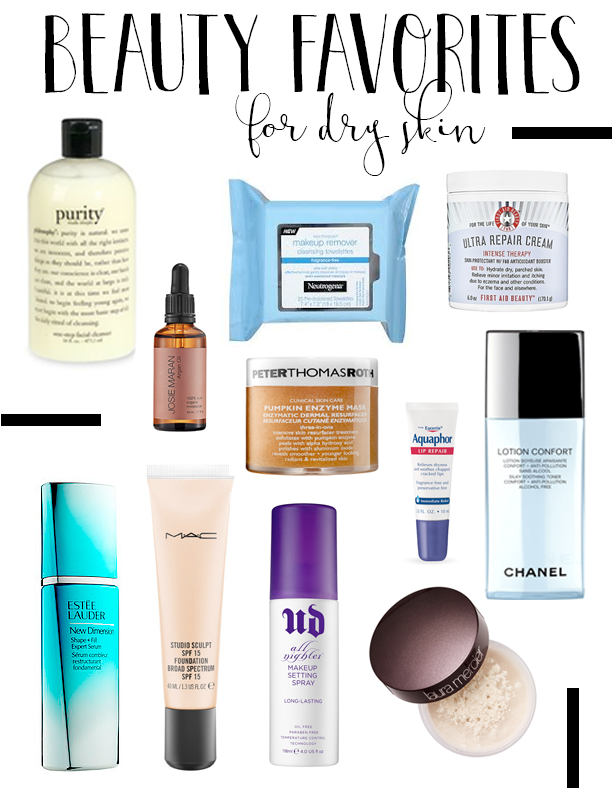 Luckily, I've found a few staples that are a must have for me that I think you will find helpful too if you have a fair complexion, have dry skin, or are just looking to try out new products. Some of these products are amazing for all skin types as well so let me know if we share some of the same favorites, or if you have any recommendations you think I should try out too! Purity - I have had my bottle of this stuff for quiet some time. It is usually my go to cleanser at the moment because it's so gentle, it's very lightly scented, & it's takes everything off. Everything. Argon Oil - I'm sure most of you are already familiar with Argon oil and all of it's uses! I use it in my hair and on my face at night time to let my skin soak it all up! Neutrogena Makeup Wipes - I have used these since high school days. I have tried so many different makeup wipes and I always end up back with these! Love that they have a fragrance free option! First Aid Beauty Ultra Repair Cream - I actually got a sample of this from Sephora and the first time I tried it, I wasn't impressed. However, I kept using it and I found that when I pair it with the Estee Lauder New Dimension Serum, it is bomb!! It left my face feeling like butter. Peter Thomas Roth Pumpkin Enzyme Mask - This was also a spur of the moment purchase after reading reviews. I got it in a pack with the Rose Mask & Cucumber one, but this one is my favorite! It doesn't feel itchy when you use it, the smell is amazing, and it feels amazing after rinsing off. Aquaphor Lip Balm - Lip balms I feel are hit or miss. And for whatever reason, with Carmex, Burts Bees, and a few others they make my lips break out with sores. I haven't found why that is exactly unless there's some ingredient in them that makes my skin react so badly, but Aquaphor has worked wonders and is SO hydrating! Chanel Lotion Confort Toner - This is also a staple I've used since high school. I love Chanel's cleansing milk & the entire "hydra" like for dry skin. It is pricey but you get what you pay for. There have been so many times I've bought other things to try and I regretted it wishing I had just paid for the moisturizer and cleanser! The toner though makes my skin feel refreshed and never leaves it tight feeling. Estee Lauder New Dimension Serum - My mom is a huge Estee Lauder fan and always gets free samples of their newest stuff to try. Last time I was home, she gave me a bunch of different ones and I tried this dimension serum on a whim. Not expecting to be impressed because it's hard for me to be with skin care - ummmmm I need the big size bottle of this stuff. I know products claim to do certain things and companies make them intriguing on purpose so you'll buy them but holy moly. This impressed me. It''s supposed to make your complexion more radiant & help define the look of your facial contours and I swear it made a difference by the 2nd time I tried it. MAC Studio Sculpt - I have stood by this studio sculpt foundation for quite some time. I like a medium/full coverage and this stuff doesn't go anywhere. I know some people with dry skin don't think they need a powder to set it either, but setting it makes it last 10x longer. I can wear this stuff all day, sleep in it (which is not a good idea though), wake up and it still be set. Urban Decay All Nighter Spray - If you don't have this in your makeup bag, you need it. It works the same way as I said the studio sculpt does. Spray this on your face and you could sleep in it and wake up still flawless. Laura Mercier Translucent Setting Powder - Another MUST have. Like you MUST have it because you NEED it. I mean it. This powder is just ... gold. Without actually being gold ;) I love this one days where I wear minimal makeup, but I use it every time I put makeup on my face. To "bake" under the eyes with, under neath where I put my bronzer ... so many ways to use it and it's AMAZING. It also leaves a flawless and smooth finish.